Drones are an amazing piece of technology that can be used to shoot video for entertainment, leisure, and many other different purposes. They're even praised for their ability to deliver packages from one place to another. They're so popular that in 2015, about 400,000 drones were purchased just for Christmas presents. While drones are extremely useful, it's important that you're always 100% safe while using them. When it comes to flying a drone, there are few things that you need to know about what you should do and what you shouldn't do to avoid drone repair and injuries. Flying a drone in good weather is always the best option. If you decide to fly your drone in a rainstorm, you're risking damage to your drone and potentially to people or property around it. Before you head out to fly your drone for the day, make sure you check the weather forecast. Even if the weather looks good in the long-term forecast, it's important to remember it can change at a moment's notice. That way, you won't need to worry about ending your fun early due to an impending storm. In addition, you'll be safe from having to spend extra money on drone repairs. You might find a really interesting shot from a certain location, but that location could be somebody's home. No matter how badly you want to shoot from there, it's important that you always ask permission. If you don't have permission and someone sees your drone flying above their home, privacy issues could ensue. People have been known to throw rocks and even shoot down drones if they see them flying over their home without prior knowledge. If your drone was to land on someone's home or crash in their yard, safe to say you're in for some trouble. If your drone comes in contact with a person, things could get ugly. You can potentially injure somebody, as a drone is powered by propellers that help the device move quickly through the air. You probably don't want to be faced with an injury lawsuit due to your poor drone judgment. At the end of the day, just think about how you can best use your drone in the safest way possible. Drones are extremely useful in media and in leisure. If you're a drone enthusiast, go ahead and use your drone however you like. Just make sure you're using it safely and responsibly! 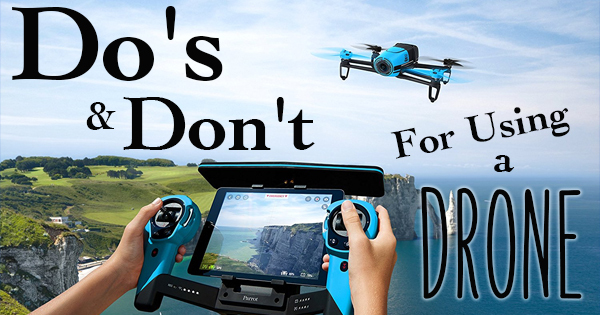 Follow the tips listed above to ensure everyone's safety and avoid unnecessary drone repair.